To order your choice of Modules from the EDA Product Knowledge Programme you'll need two forms and both are available to download on this page: the Manager Payment and Order Form and the Learner Application Form. Both forms are available on this page, and both are digitally fillable. Just download, save on your computer and fill in. If you have any questions please call the EDA on 020 3141 7350 or use the online form linked below. Order using your existing IET credit account. If you use this option, please supply a copy of your Purchase Order (PO) with your order. Set up a new IET credit account. To open a new IET Credit Account simply download the IET’s Application for New Customer form here. When completed, please email your form to the IET using this link. If you have any questions about this process, please contact the IET’s Customer Service Team on 01438 767328. Pay for your order in advance using a credit card or BACS. You do not need to provide a copy of a PO at the time of ordering as a proforma invoice will be issued on receipt of your order with details of how to pay. Please read the Guidance Notes further down this page to help you with your order but if you have any questions contact the EDA team on 020 3141 7350. Save each form onto your PC. Right click when the form opens and save in your system. You can then reopen the Forms. Return your completed forms to our dedicated in box. If you have completed the forms by hand please fax them to the EDA on 020 7602 0613, or you can scan them and return by email. When you receive the module Textbook, you’ll find a welcome letter with essential information about next steps. Your learner will receive email support from edaproductknowledge@theiet.org.uk and you, as the manager, are copied in. This is an important email address as it’s also where the results come from, so please check your junk folder, just in case, as we don’t want you to miss crucial information. You only need one of these forms for each order. Please read the guidance notes on this page before placing your order and remember, there are discounts for multiple modules ordered. Once you’ve placed your order, look out for important messages about the next steps from edaproductknowledge@theiet.org Don’t forget to check your junk emails, just in case. You’ll need one of these for each learner you are ordering for. You can include multiple Learner Application Forms in an order. The manager form summarises all the Learner Forms. You’ll receive a welcome email and follow up messages which help you stay on track. Don’t forget to check your junk emails, just in case. Cables and Cable Management – available now. Customer Services – available now. A single Module costs £150. For 2 – 4 Modules the price comes down to £145 per Module, and for 5+ Modules it’s reduced event further to £130 per Module. This discount is applied to your total order, not to the number of modules you order for each learner. You can order for multiple learners in one order. You’ll find details of the three payment options at the top of this page. You should complete one Manager Payment and Order Form per order, but you’ll need to complete a separate Learner Application Form for each person you are ordering modules for. 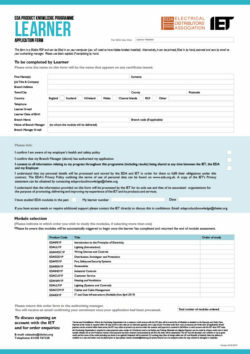 For example, if you are ordering modules for three people, you will need to complete three Learner Application Forms. Don’t forget to add up the total number of Learner Application Forms you are submitting AND the total number of modules ordered and include this in the boxes provided at the foot of the Manager Payment and Order Form. On the Learner Form you will need to tell us in which order the Modules will be studied. The next book in the sequence will only be issued once the learner has completed the assessment for the previous module. There is no need to add VAT to the prices of the modules. You have three payment options which you can read about here. Once we’ve received your forms (to place your order simply email them via this link), and you have pre-paid if you don’t have an IET credit account, the first Module textbook will be sent out to you within 3 – 5 working days by FedEx. If the Learner needs additional study support please let us know. This could also include additional time to work through the Module and End of Module Assessment (EMA). The standard timescale is 10 weeks from the start of study to completion and return of the EMA. To discuss this support please email the IET here. The results are in: once your EMA has been marked, we’ll send you the results by email. If the Learner in your team leaves your business after you have placed the order, you can transfer the Module to another member of your team as long as the End of Module Assessment has not been requested. To request the transfer, please email the IET here. Managers: you must request the EMA by email, it is not sent out automatically. When your learner is ready to take their EMA, usually around the 8 week point, email edaproductknowledge@theiet.org with the learner’s name and the module they are studying. The EMA, which is digitally fillable, will be emailed to you as the manager, for you to send on to your learner. It does not have to be completed in one go, but can be broken down into manageable blocks. It is an open book assessment. That means learners can refer to their textbooks (and other texts) during the EMA. It should be completed electronically. Unlike the hard copy textbook, the EMA is emailed to the manager to forward on to the learner. which is sent to the learner by email, filled in online by the learner and then e-mailed back to the IET for marking along with any additional documents or information that the learner wants to add to their answers. If the EMA is not returned within the 10 weeks, and no extension has been requested, it will be graded ‘Fail due to non return’. At no point should the learner send back their textbook, it’s theirs to keep.